All things are in a state of evolution , including crop circles , in fact crop circles have evolved so much in the last 30 years or so , I don’t know why we are even still calling the Crop Circles, they are anything but circles these days. The so called crop circles of the 21st century are a highly complex type of pictogram , utilizing advanced mathematics like the Fibonacci Sequence and Scared Geometry , and their message if you will, is a essentially coming from the universe itself … or consciousness… at least that’s what I think is happening… intuitively ! Anyone who still believes these complex, geometrically and mathematically perfect designs in the crops that suddenly appear manufactured by humans stomping about with boards on their feet in the middle of the night , are likely still waiting for Santa to come down the chimney ! There has been an incredible amount of research into this phenomenon , and the fact that it is so tangible , in your face and there for anyone to witness makes it the prefect vehicle for communication from the others , whether they be extraterrestrial or simply our own collective consciousness … are a combination of both perhaps … of course in the end, there is only one being talking to itself … that’s us! Crop Circles are perhaps the most startling evidence that there is more going on than meets the eye. And meet the eyes they does, talk about eye candy. Crop circles and the debate about crop circles has been going on for decades , however recently , say in the last several years they have taken on a whole new complexity that is absolutely breath taking. When you look at the sheer size , detail , complexity, and message of the more modern crop circles it is impossible to imagine that humans on the ground with boards on their feet are stamping these patterns out in the darkness of night. I certainly don’t believe that , and more people everyday are coming to that same conclusion. This new generation of crop circles seems to be speaking to us, to our awakening, like some kind of massive story book , using pictures and symbols that spark the re-awakening process. 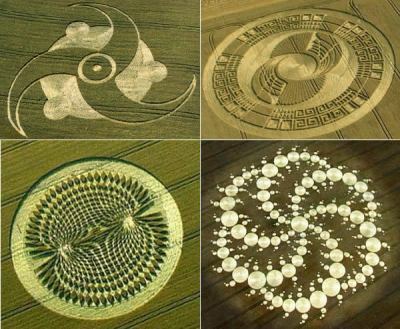 My feeling , my intuitive feeling is that these crop circles are basically us, infinite consciousness, in its myriad of forms , such as other races, other collectives, other dimensional beings , all of it. And we are having a conversation with ourselves, about the nature of reality, and what better way to do this if you think about it. These fields are like giant chalk boards that we use , in the giant classroom we call earth, physicality. Some people want to write it off as pranks by drunk college students , or “Aliens” , what ever that means , wake up people, we are all Aliens , we are all hybrid beings, from other places throughout the cosmos. When closely examined the crop circles are so perfectly created , each blade of grass or grain is perfectly laying down in a unique pattern that defies our ability to explain how they are done. There is also radiation signatures and other chemical anomalies that defy any known explanation , when investigators look closely at these sites . I wasn’t quite sure what my own theory on Crop Circles was until recently, when I heard Bashar talk about the subject. The way he explains it pretty much sums up what I have been talking about here, we are using these agriculture fields like a giant computer screen to share what we are learning. 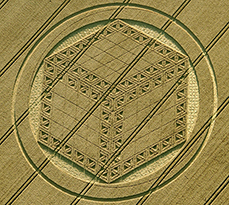 These Crop Circles are being created by consciousness, no “machines” are needed, we are literally imprinting these fields like a printer prints individual pixels on a piece of paper to make an image, it makes perfect sense. Except in this case the piece of paper is a 50 acres of wheat ! It’s Brilliant !